Self-care is something that I have been thinking about a lot recently, I only have one body and I want to take care of it and so today I am sharing 7 simple self-care ideas you can do quickly that will help you pause and take a moment to yourself. If you love to DIY, you can also find some of my favorite Homemade Beauty Recipes HERE. 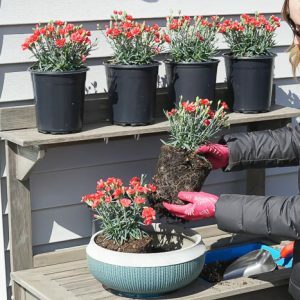 If you are looking to take a little time for a self-care Sunday or a self-care Saturday or even a quick 5 minutes of self-care mid-week, here are my favorite ways to add a little self-care into my life. This is a good thing most of the time I think. But sometimes, in order to keep caring for others, I need to pause and care for myself. For me, it is the simple self-care ideas that I can fit seamlessly into my life that seem to make the most impact. So I am sharing 7 simple self-care ideas with you that I have been able to seamlessly fit into my everyday life. But you can also group these together and enjoy a whole morning/afternoon/day of self-care. 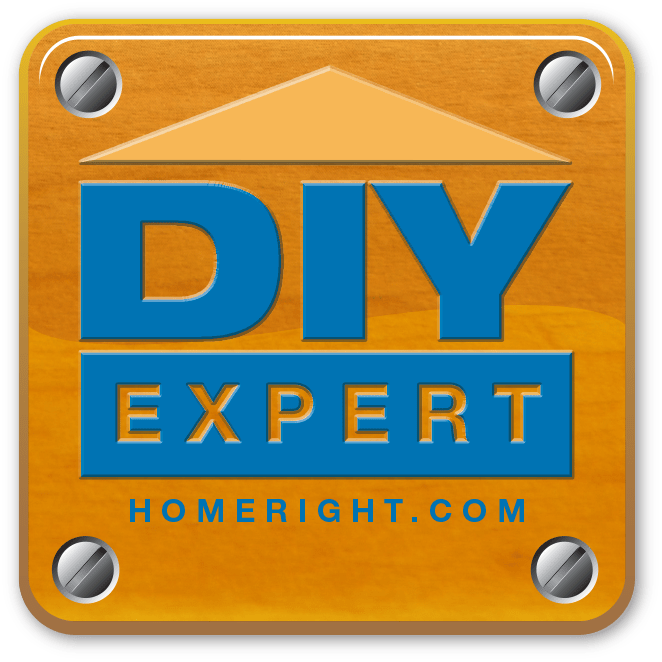 And in true Simply Designing form, these are mostly DIY ideas! 🙂 You knew that was going to be the case, right? Perhaps one of my absolute favorite things right now is to take a detox bath. It is 20 minutes of “me” time that I can use to help restore my body, detox it from the toxins of everyday life, and recharge. It also is amazing to help support natural sleep patterns so I love doing this before bed to help me relax and unwind! My favorite detox bath recipe is super easy! 2 parts Epson Salts, 1 part Baking Soda and about 6 drops of my favorite Essential Oils. Easy as can be! 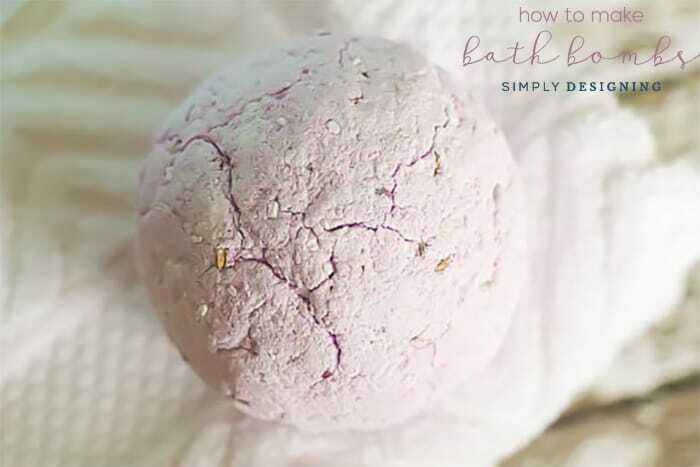 To help make taking a detox bath even easier and more fun! 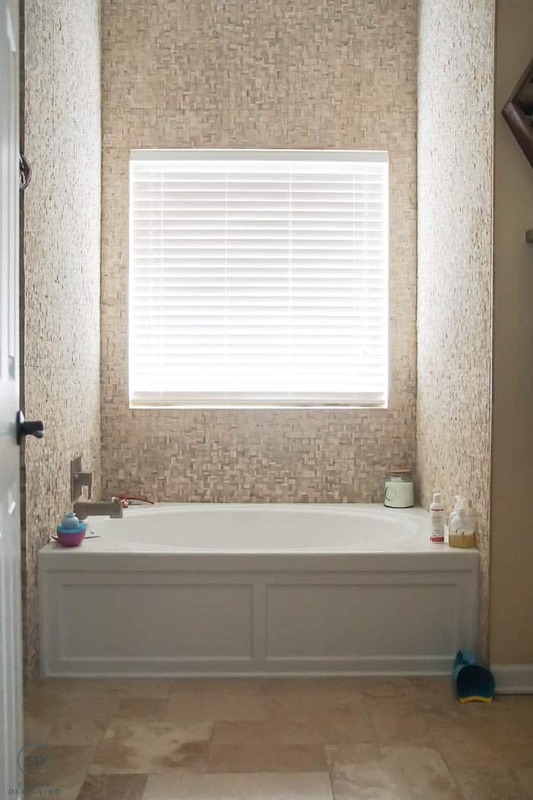 I decided it was time to take back my bathtub, decorate it, buy some new towels and set up a bath salt station so that I can more easily take time to relax, enjoy and unwind. I moved all the baby toys off the tub and finally decorated this space. I added a vase and greenery to one corner that I already had around, and then decided to add a few other things that were both beautiful and practical in the space. 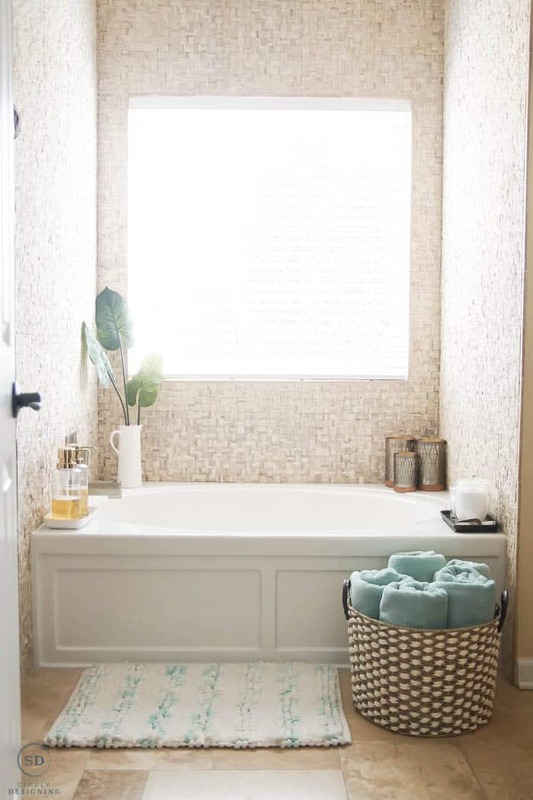 I added a new bath mat because we never had one in front of the bathtub and I was always moving our one bath mat back and forth between the tub and the shower. 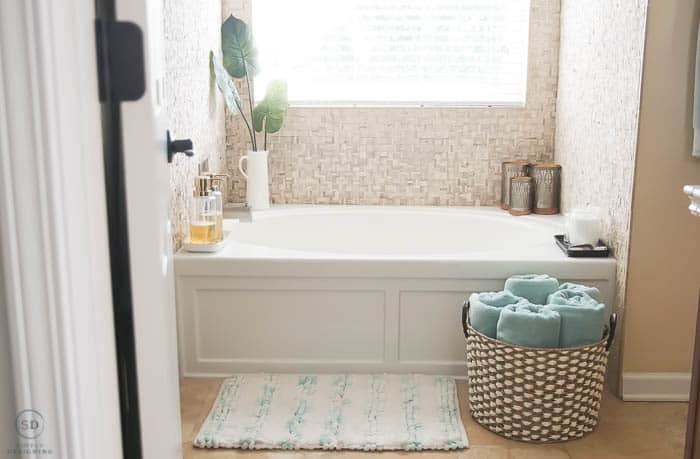 This Loop Cut Pile Watercolor Noodle Bath Mat in Aquaifer from Better Homes & Gardens sold exclusively at Walmart is so incredibly soft with just a touch of color. 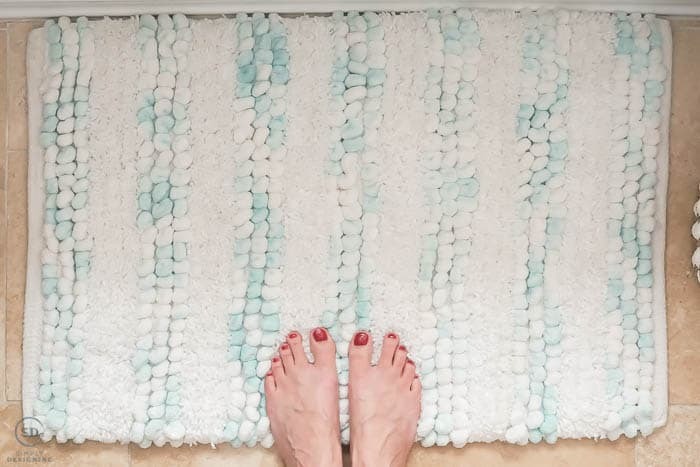 My feet love stepping onto this mat after a bath…it feels so luxurious and soft. 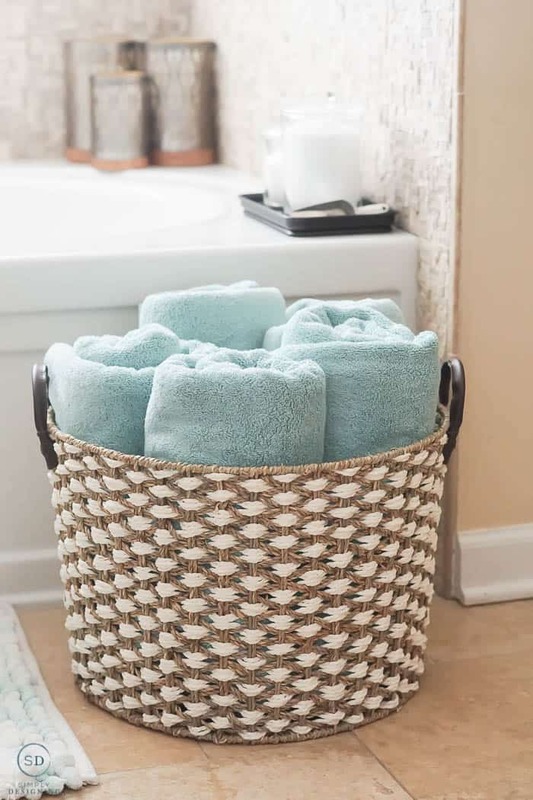 I placed a beautiful Seagrass Basket from Better Homes & Gardens sold exclusively at Walmart on the floor near my tub and filled it with towels. 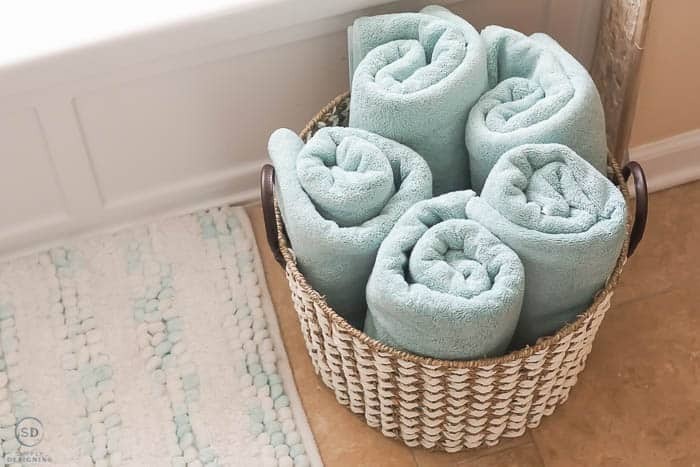 These gorgeous and oh-so-soft Thick and Plush Solid Bath Towels in Aquaifer from Better Homes & Gardens sold exclusively at Walmart add the perfect pop of spa-like color to my bathroom while being super soft and absorbent. I love the idea of candles, but I don’t burn candles in my home for several reasons. 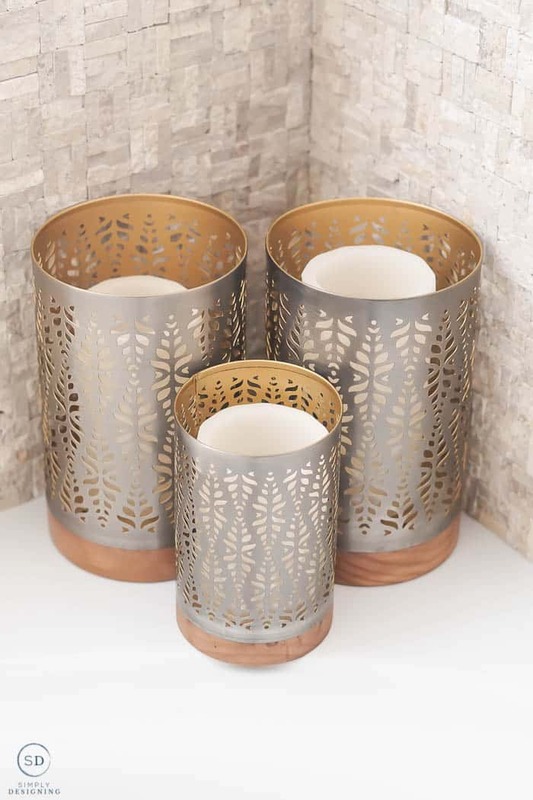 So I decided to snag these Geo Flameless LED Candles from Better Homes & Gardens sold exclusively at Walmart and place them in these Metal Wood Hurricane Candle Holders from Better Homes & Gardens sold exclusively at Walmart. They are so beautiful and I love that I can just push a button for instant ambience. I wanted to create my own bath salt bar so that I could easily make bath salts any time I want a detox bath. I placed Epson Salts in a Glass Apothecary Jar from Better Homes & Gardens sold exclusively at Walmart and Baking Soda in another one. 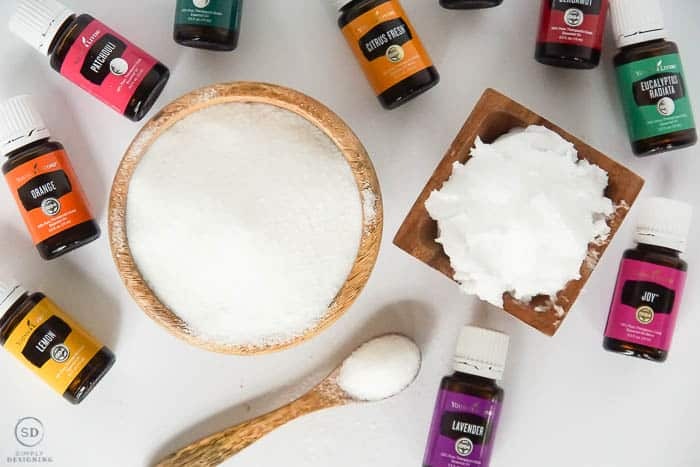 So when I am ready for a bath I just need to take 1 scoop of baking soda, and 2 scoops of Epson salts, mix it with Essential Oils if I want, and then pour them into the bathtub! I love having a bath salt station so close to my tub! It makes everything so much easier. 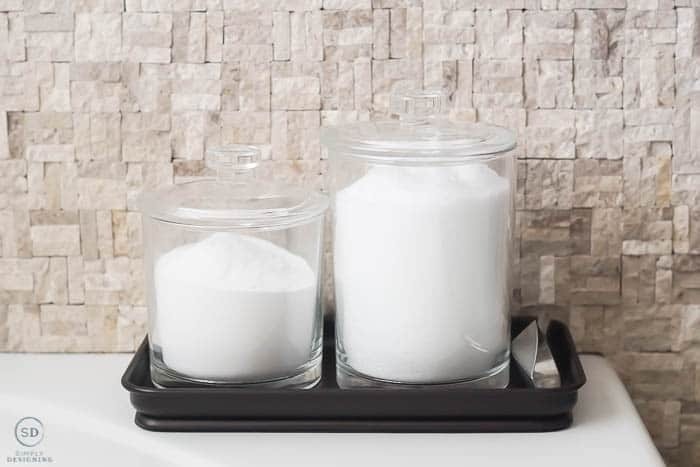 I placed both of those containers on a Vanity Organization Tray from Better Homes & Gardens sold exclusively at Walmart to contain anything that might accidentally spill. 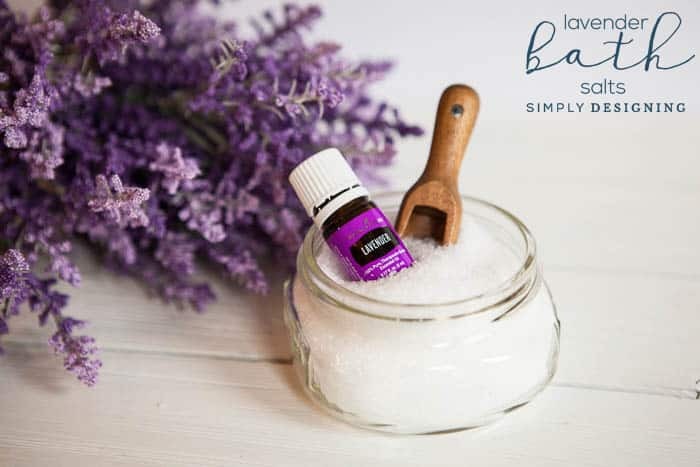 This is the perfect way to quickly add bath salts to a hot bath. 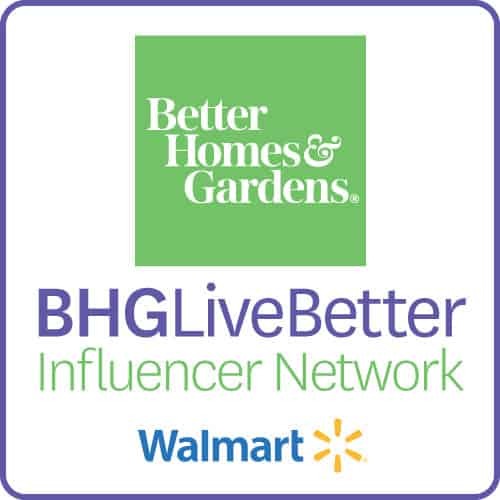 To contain the bath soap and keep it organized and beautiful, I poured it into these Large Shampoo Pumps from Better Homes & Gardens sold exclusively at Walmart. I love the gold tops on these bottles, they are so beautiful and elegant. We love to keep our soap simple and clean and I filled my pumps with unscented Castile Soap. 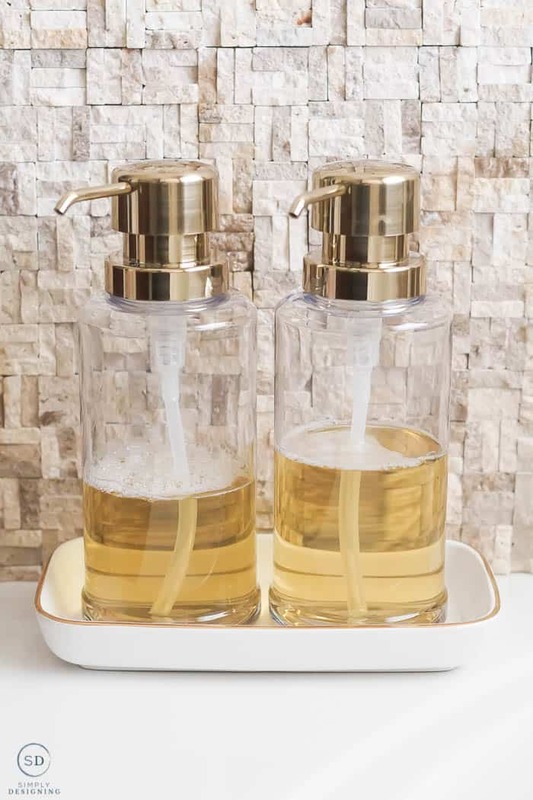 And because I like to keep things neat and tidy, I placed both soap bottles on a Gold and White Tray from Better Homes & Gardens sold exclusively at Walmart. This is so beautiful and I just love the touch of gold. 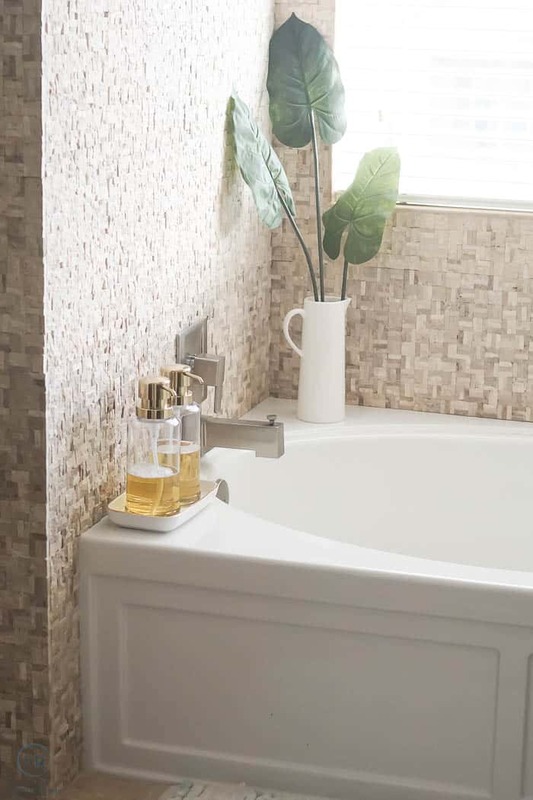 Updating my bathroom to be more relaxing and organized makes me so happy and is now the perfect place to take a detox bath and the ideal spot for a little self-care! 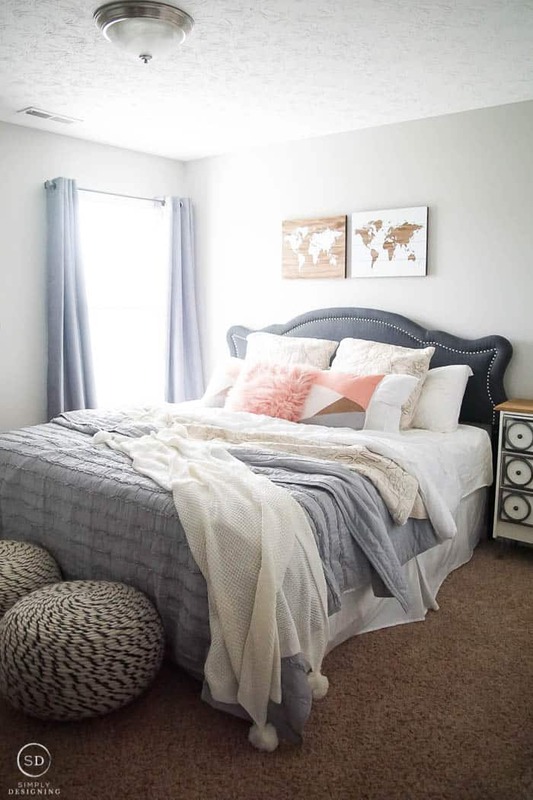 Amazing what a difference a little decor can make! While I am sitting in a detox bath, I love to put a mask on my face and give my face a little pampering while I soak. I often do a simple mask with Bentonite Clay and Apple Cider Vinegar…it is amazing for your skin! Just use 1 part bentonite clay and 2 parts apple cider vinegar, mix together, and spread on face. Be sure to mix this in a non-metal bowl with a non-metal spoon. 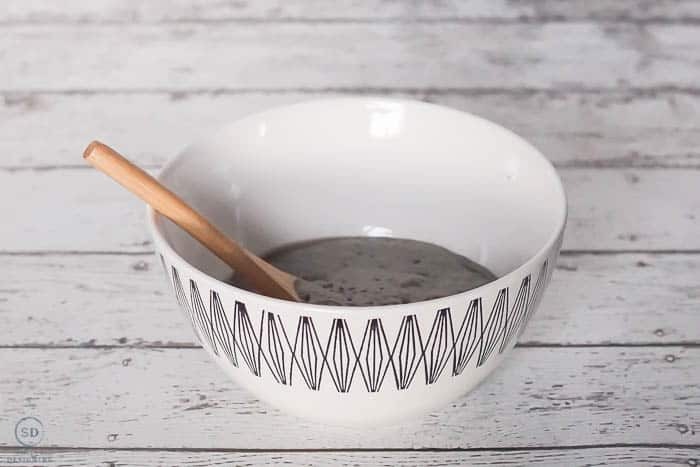 I love to mix my mask together in a beautiful bowl like this Parkmor Stoneware bowl from Better Homes & Gardens sold exclusively at Walmart. Oh-so-pretty! And then simply wash it off with a warm wet washcloth. Detox baths, masks, body scrubs all fall squarely into the self-care category. Why? Because they make you feel AMAZING! Body scrubs are the best way to slough off dead skin and rejuvenate your whole body. And my skin always loves a good scrub! 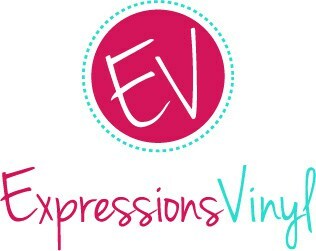 I have shared a few of my favorite scrubs on my blog. You can check them all out below. I don’t bake often, but I have been trying to set aside time on Sunday’s to start baking again. Baking might not be your thing, I get it, so maybe cook, or take a cooking or baking class. Or find a hobby you love and spend time actually doing it! For me I actually enjoy baking, and I love to involve my kids in it. If I am not rushed, it is actually relaxing and fun! And then we have a delicious TREAT! And I am a huge sucker for treats. 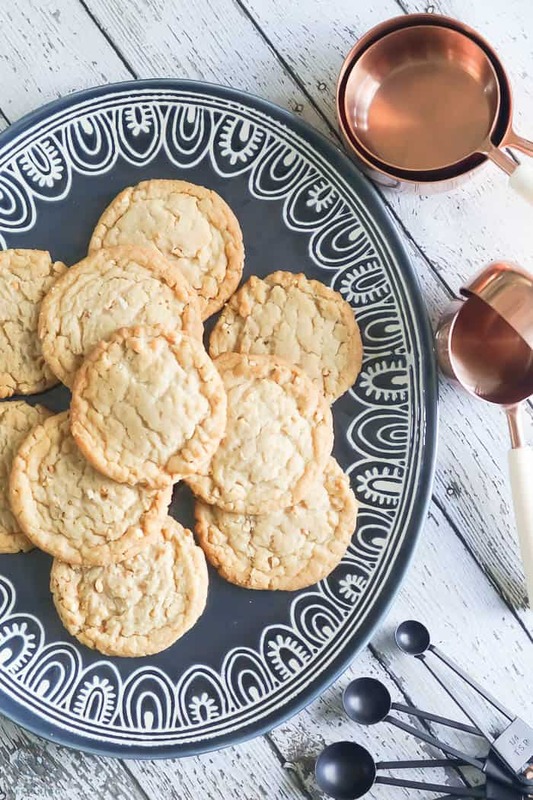 Chocolate chip cookies are a weakness right now and so by taking the time to bake a treat I love, and then allowing myself to eat 1 or 2 or 10, I am treating myself to a special moment which is the ultimate self-care. I also really find rejuvenation and strength in serving. So we often wrap up extra treats and deliver them to friends and family. I know, I know, this is supposed to be about SELF-care and I have already talked about doing something for someone else…but I really, honestly, do find this fulfilling in my life so it works for me. 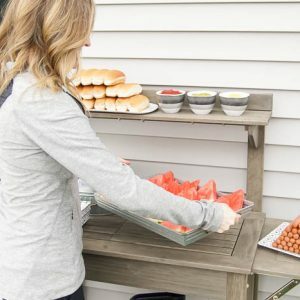 And this beautiful Teal Medallion Oval Serve Platter from Better Homes & Gardens sold exclusively at Walmart is such beautiful way platter or your treats to be put on once finished! Here are a few of our favorite treats for our family but also to give away. Clearly, we love chocolate in our family! Reading an actual book is a luxury to me! I long for those long hot summer days where I can lounge around and read all day. Ha. Who am I kidding!? I am an adult…those days are few and far between. Reading is like the ultimate form of self-care, a moment spent just for me, engulfed in a book is a total luxury. Whether you are reading a magazine, a physical book or an ebook, reading is a great way to sit down, let your body and mind rest, and escape from the cares of the world. 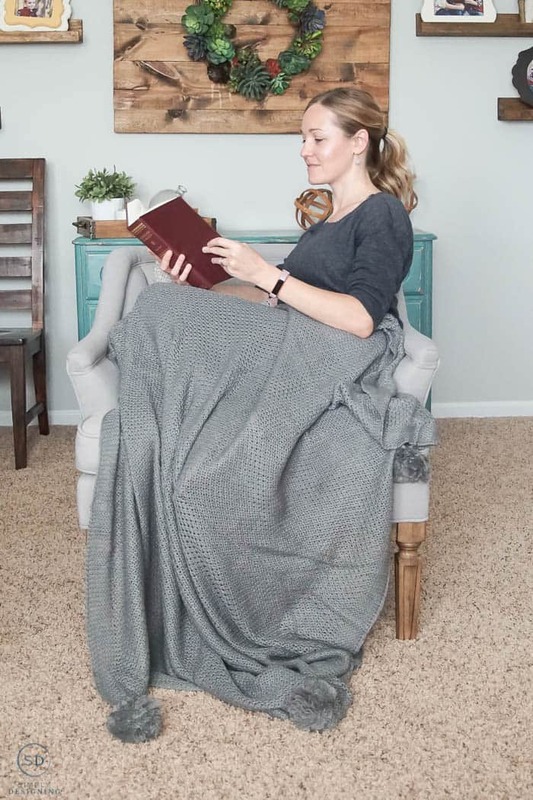 When I read, I love to snuggle up with a blanket and this Knit Pom-Pom Throw Blanket in Gray from Better Homes & Gardens sold exclusively at Walmart is super soft and cozy but light enough to be used in the fall and spring months without overheating. It is my new favorite blanket for sure. And if you are looking for a new book, I highly suggest you read Girl, Wash Your Face. I don’t usually like self-help books, but this one had me laughing so hard plus it is so inspirational, it is definitely worth the read. I know, I know, most people probably don’t think that coming up with a plan for the week is self-care. But it really is. If you truly care about yourself, and your life, it is important to plan it out. Seriously. YOU ARE IMPORTANT enough to take a few moments to plan your life out! If you don’t plan your life, who will? It needs to be you. I love to plan out my week every Sunday so that I know what I need to do and so that I am focused to accomplish it that week. One of the best ways to take care of myself is to plan ahead. I love to plan some things on my phone calendar, but on a week to week basis, I actually like to plan on paper! 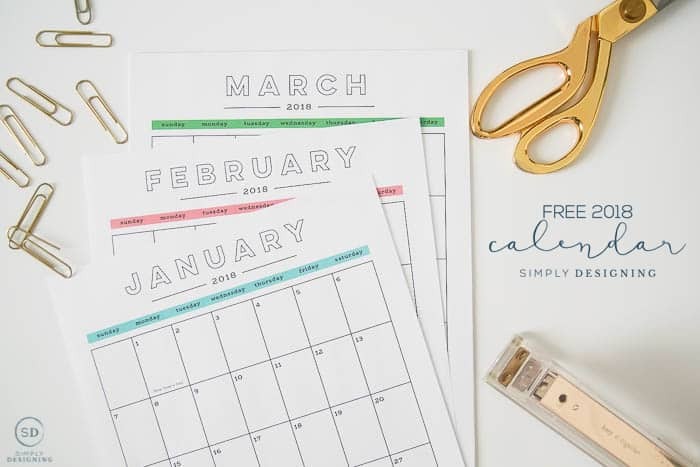 You can download my FREE Printable Monthly Calendar and my FREE Printable Weekly Calendar HERE and HERE. I know this may seem silly to some, but a clean set of sheets, straight from the dryer and onto my bed is just the best! I love climbing into a bed at night with clean sheets. I am serious. Don’t slack! Do this! Be sure you are taking your sheets off your bed once a week and washing them. Why? Besides just feeling nice and clean, it’s a hygiene thing. Humans shed half an ounce of skin every week…moisture, bacteria, skin cells, it’s just a breeding ground for all sorts of yuck. So wash those sheets often! 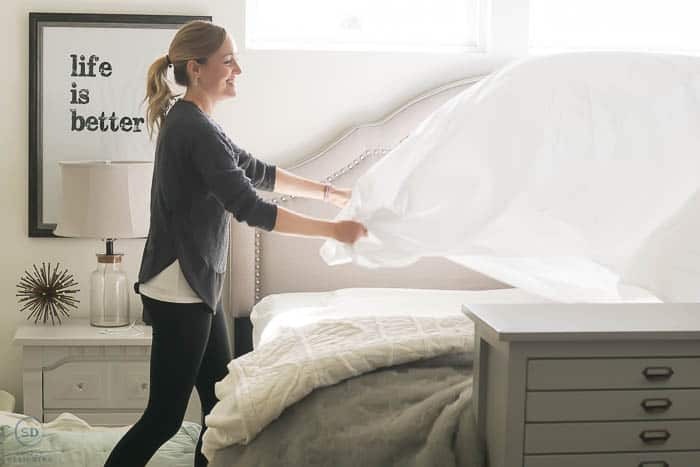 And if you need to upgrade or update your sheets, check out these Luxury Microfiber Sheets from Better Homes & Gardens sold exclusively at Walmart, they are crazy soft! Your bathtub looks gorgeous! I need those shampoo pumps! Soo cool! I need more time for me too! Great post! Sharing! Thank you for sharing on Merry Monday! Hope to see ya next week!